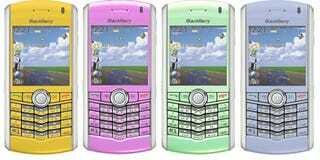 Rumors are already flying about BlackBerry's next Pearl revision, appropriately deemed the 8120. This BlackBerry is rumored for a late summer release and will be a significant update to the already existing 8100 "Pearl." Most notable is the addition of GPS, Wi-Fi, a 2-megapixel camera and three new colors (titanium, blue and gold). The latest news is that the phone will officially be hitting Rogers in Canada this September with U.S. carriers (none confirmed) getting it a week earlier, so if you are in the market for a Pearl it may be better to chill for a bit. GPS and Wi-Fi? Bye-bye battery life.